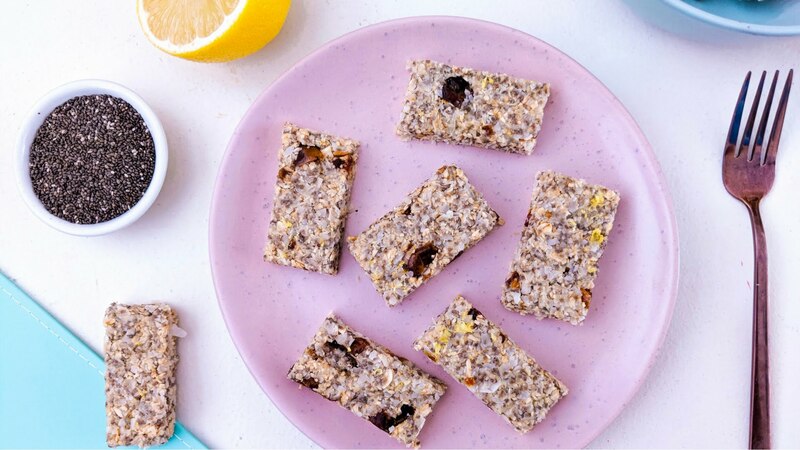 A healthy & delicious snack that you can whip up in under 5 minutes, this Lemon Chia No-Bake Slice contains chia seeds loaded with fibre, omega-3s & plant protein to aid with healthy digestion & keep you feeling full & satisfied throughout the day! 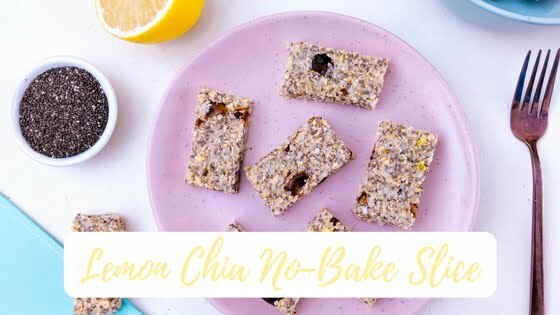 I created this recipe as part of The Chia Co’s Chia Challenge! By signing up to The Chia Challenge (which is completely free! ), you get a FREE 7-day Dietitian approved meal plan which will help you reap the health benefits of a daily serve of chia seeds. Packed full of fibre, omega-3s, plant protein, minerals and antioxidants, chia seeds can make you feel better and aid digestion & heart health, when consumed as part of a healthy, balanced diet. Click here to join The Chia Challenge. Place oats into a blender and blend into oat flour. Pour oat flour into a large mixing bowl and stir in coconut. Combine water, lemon juice and chia seeds in a small bowl, mix until combined. Add into oat mixture and stir until all dry ingredients are wet. Add dates and lemon rind. Use hands to work mixture and until it comes together into a ball. Scoop out into a baking tin lined with baking paper and press down evenly all over. Refrigerate for a few hours until set. Once set, lift baking paper out and cut into slices. Enjoy. Click here to take The Chia Challenge. Editor’s Note: This recipe was made in collaboration with The Chia Co. These have to be amazing. How do you prepare the lemon rind? How many calories does this recipie contains? I’m trying this tonight! How do you store them? Refrigerated or counter top? in australia, oats are actually classified as containing gluten.